Welcome everyone to the next Trancelucid event. Following from our awesome 2nd Birthday at the end of March this year, which had an amazing vibe on the dance floor and atmosphere we can't wait until our next event. Thanks again to everyone who came and supported the party. 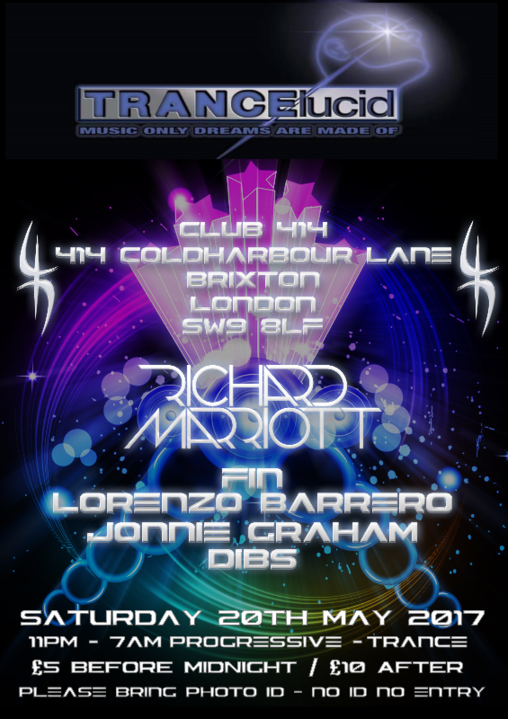 For our next event we are very much looking forward to having Richard Marriott back to play for us. Richard last played for us at the start of last year and played a quality Trance set, which included some of his own productions, which went down really well on the dance floor. Having taking a bit of time out to concentrate on other stuff he is now ready to rock the dance floor. You can expect to hear at this event some new material of his. We also welcome back Fin, who is a crowd favourite at our parties when he plays for us, as he has always played quality sets when we have had him to play. He shall be playing a extended and longer warm up set and with some melodic, progressive tunes. Jonnie Graham is another one who we welcome back to play. Jonnie has been pretty busy of late, but is raring to go again. If your a fan of the banging Techy Trancey stuff then I'm sure you won't want to miss him. We also welcome back Dibs to play at this event. Dibs last played for us at our December party last year and played a great Trance/Harder Trance set. He is another DJ who has a big passion for Trance music. Joining them shall be the main guy behind Trancelucid and Promoter/Resident DJ Lorenzo Barrero.